I've been asked from time to time why we've never reviewed any of Drobo's NASes. The story is I've tried, but company management was reluctant to submit their NAS for review, fearing its performance would not compare favorably. Yes, we could have purchased the product and reviewed it, but other priorities always got in the way. Drobo's new management that took over when Drobo was spun off from Connected Data in 2015, however, has no such fears. So when they were ready to launch an updated version of the 5 bay Drobo 5N, they reached out and readily offered a sample for review. The 5N2 looks very much like the model 5N it replaces, housed in a sturdy aluminum black matte finish box. The only external clue that you're looking at a 5N2 is the two Gigabit Ethernet ports on the rear panel. The 5N2 retains the 5N's carrier-less drive bay design; you just slide drives right in. The tradeoff for eliminating drive trays is that only 3.5" SATA drives are supported for direct insertion. If you want to use 2.5" drives, Drobo recommends Icy Dock's EZConvert Pro MB982SP-1S. But at around $25 a pop, you may decide to stick with good ol' hard drives. Making that choice a bit easier is the Drobo Accelerator bay on the bottom, which holds one mSATA SSD. Inserting the drive activates a "hot cache". Drobo says this will help most with workloads that contain a random read component, for example, loading a Lightroom library. My Drobo contact said typical performance gain may be in the 20 - 30% range, once the cache has had time to "heat up", i.e. be loaded with commonly accessed data. Other than the dual Ethernet ports and mSATA bay, the 5N2 lacks features available on even entry level NASes. There are no USB or eSATA ports for attached backup or printer sharing; no HDMI ports to play content to an attached screen. There's not even a buzzer to signal shutdown start, boot-up end or alert situations. The drive lights do blink when something unusual is going on with the drives, however, such as volume rebuilds or drive faults. Drobo puts a convenient LED decoder right on the inside of the front cover. There is also a set of blue capacity LEDs on the front panel too; each one indicates 10% of used capacity. Disassembly took a bit of figuring out after easily removing the outer shell. After that, it took a little poking to get it down to the view shown below, showing the five drive bays and the main board sitting on the bottom of the case. Flipping the view around reveals the battery that provides power for long enough to write pending data to disk and cleanly shut down. Removing the main board and taking off the heatsink reveals the 5N2 is powered by a Marvell quad core Armada XP ARMv7 CPU @ 1.6 GHz. The bottom of the board has the mSATA cache SSD slot. That's the second Marvell 88E1318-NNB2 Gigabit Ethernet PHY at upper left beside the mSATA slot. All the key components are shown in the table below. The 5N2 drew 35 W with four of our stock WD Red 1 TB (WD10EFRX) drives spun up and 21 W in power save mode with the drives spun down. Fan and drive noise was rated very low, running whisper quiet in our low-noise home office. One of Drobo's chief value-adds is that it's easy to set up and use. It's made for people who don't want to make a career or hobby out of storage mangement. The quick start card that you can't miss as you unpack your Drobo points you to a setup wizard at http://www.drobo.com/start that walks you through everything you need to do. It even has a fork to handle migrating a set of drives from another Drobo. The 5N video below provides a good overview of the setup process. There is no web admin interface in the 5N2. Instead, you install Windows or MacOS Drobo Dashboard apps to manage one or many Drobos. The default view shows all Drobos detected, both direct and network attached flavors. Double clicking on a Drobo brings up its Status. You can cycle through System, Drive and Network status screens. 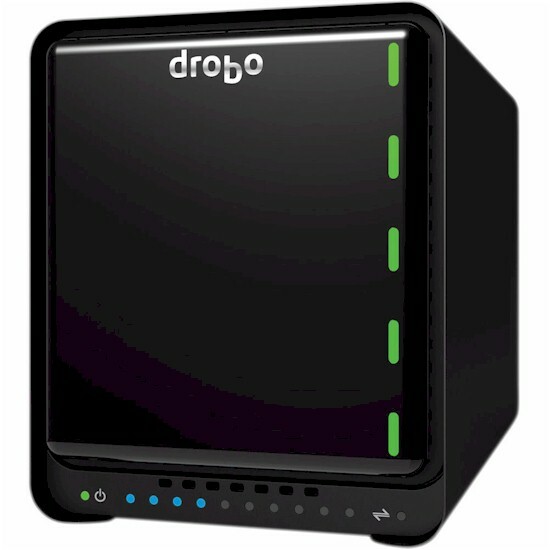 Drobo's "Beyond RAID" system is the grand-daddy (or mother) of the hybrid / automatic RAID systems. Key differences from other automatic RAID systems are the ability to mix drive sizes and to change drive sizes as your capacity requirements grow. Although you can do that on other NASes, volume size will be limited by the smallest drive. With Beyond RAID, you'll get more total capacity. For example, Drobo's Capacity Calculator shows three 1 TB drives will yield a 1.81 TB volume and three 2 TB drives will yield 3.63 TB. Changing one of the three 2 TB drives to 1 TB drops capacity down to only 2.72 TB instead of 1.81. Note that each drive swap will initiate a volume rebuild process that will take hours. As with any other RAID system, if something happens during that rebuild process, you can lose your volume, unless you enable dual-disk redundancy. Still, you need to be as careful with Drobo as you are with any other centralized data storage device. This means putting it on a UPS / battery backup and not trusting it to be the sole repository of your precious data. The Capacity screen shows the capacity of the single volume created from all inserted drives. The 5N2 supports a single volume up to 64 TB. The 1.64 TB capacity shown here results from four 1 TB drives with dual-disk redundancy enabled. The default configuration allows one drive to fail without killing the volume. Shares can be created, assigned to users and have access privileges set. A mapped drive is automatically created in Windows for each share if you're running Drobo Dashboard. If you're not, you can still browse to shares and create your own drive mapping if you desire. SMB and AFP network file systems are supported by default. You have the option of assigning a share to MacOS Time Machine backup. The space you assign when creating this share is reserved exclusively for Time Machine backup in that space isn't reclaimed as data is deleted. Drobo has a decent set of installable apps that are managed via the Drobo Apps page. The list includes the apps shown below. An up-to-date list is found here. Note that FTP support can be added by installing ProFTPD and NFS via an NFS app. Linux shell access can be added by installing the Bash shell and Dropbear SSH apps. Drobo's most glaring weakness is in backing up its own data. The 5N2 has no USB ports, so attached backup is out. The main local backup solution is DroboDR, a replication feature that requires another Drobo as target. DroboDR incrementally backs up the entire Drobo volume to a target NAS on a scheduled basis, with two hours as the smallest interval. Versioning and snapshotting are not supported. The only other options for backing up the 5N2 are BitTorrent Sync, ElephantDrive, ownCloud and Pydio cloud services. Each is supported via an installable app. Remote access to your files is enabled via the myDrobo app. DroboPix and companion iOS and Android apps let you view and play photos, music and videos and DroboAccess does the same for web browser access. One final feature worthy of note is Drobo's Network Interface Bonding for its two Gigabit Ethernet ports. Drobo says this feature does not require 802.3ad link aggregation support on your network switch. Just connect both Drobo's ports to ports on your switch, check the Network Interface Bonding box on the Network Settings screen and restart. You'll get a new IP address for your bonded port and higher throughput when multiple devices are simultaneously accessing the Drobo. Firmware version 4.0.0[13.13.89501] was loaded onto the 5N2 and performance tests were run using the Revision 5 NAS test process. All tests were run using Western Digital Red 1 TB WD10EFRX (x4 SNB supplied). Although the sample 5N2 Drobo provided had an mSATA SSD installed, that's not the stock configuration. So I removed it for most testing. Since Drobo doesn't allow direct control of RAID levels, I can't fairly directly compare it to other NASes in the charts. In fact, I created a new "Auto" class so the NAS Ranker wouldn't mix it in with RAID5 class products. But since the 5N2's default mode is single disk redundancy and a four-drive volume was used, results are posted in the NAS Charts as RAID5. The benchmark summary below show performance typical of today's NASes, i.e. file copy of large continuous files pretty much max out the capacity of a Gigabit Ethernet connection. The main exception is NASPT File Copy to NAS (write), which is about 10 MB/s low compared to the other File Copy results. For comparison, I chose a typical mid-range NAS, Synology's DS416. It costs around $350 vs. the 5N2's $499 and is powered by a dual-core Annapurna Labs Alpine AL-212 vs. the 5N2's quad-core Marvell Armada XP. The comparison shows only one other benchmark where the Drobo's performance significantly lags: NASPT Directory Copy to NAS. 1 Drive, No Cache: This is the data entered into the NAS Charts, taken with default single drive redundancy and no SSD cache. It would be the default performance for a stock 5N2 with four drives. 1 Drive, w/ Cache: Same as above, but with SSD cache installed. 2 Drive, No Cache: SSD cache removed, dual-drive redundancy enabled and volume resync completed. Volume Build: Test was run while volume was being changed from single to dual-drive redundancy. SSD cache doesn't provide any benefit in these tests because the benchmarks are designed to defeat cache effects. The results also show no performance penalty (or advantage) when using dual-drive redundancy. The only price paid there is lots of storage capacity. There is a significant read hit when volumes are being rebuilt, but that's to be expected. There may be many reasons you would not choose a Drobo as your NAS, but performance is no longer one of them. Sure, you'll pay a price premium for the benefit of being able to painlessly expand storage capacity and use whatever 3.5" drives you have lying around. But Drobo will move those large media files around as well as most any other NAS you can buy. I'd really like to see Drobo provide more options for backing up its files. Backup via standard rsync would be a minimum; backup via SMB and FTP like NETGEAR ReadyNAS has would nice additions, too. As robust as Drobo is, hardware failures do happen, as do fire and theft. If you want to easiest and surest way of expanding storage if and when you need it and don't mind paying more, then you should check out Drobo's 5N2.